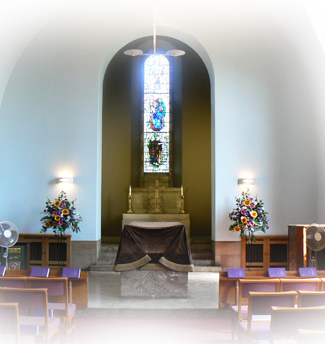 There are two service rooms at Warriston Crematorium: the Lorimer which seats 230 people and the Cloister which seats 60. Both have external speakers in case of overflow so that additional mourners who cannot be accommodated inside can hear the service. The service rooms are open for services six days a week, Monday to Saturday. Services on Saturday afternoons are subject to restricted availability. Both service rooms allow 40 minute services with the Lorimer starting on the hour and the Cloister on the half hour. The first service is at 9.00am and the last at 4.30pm. The service itself should finish at least 20 minutes prior to the following service, to allow sufficient time for mourners to leave the chapel and for the staff to prepare for the next funeral. It is possible to book extra time at a nominal fee should you feel you need it. Our service rooms (Chapels) are non-denominational. We aim for them to be used by people of all faiths and of none. Certain Christian symbols are present, but we will remove these on request. We also have symbols representing the Sikh, Hindu and Buddhist religions, which can be placed in the chapel on request. We would ask for 24 hours’ notice of any such requests. It is not necessary for a minister or other religious official to officiate at the service and indeed a member of the family or a friend of the family can take on this role. Our digital music system contains a comprehensive range of music from traditional to modern. We are able to source additional music, providing it is currently commercially available, although we will need at least two working days’ notice. The chapel has and organ, and we provide an organist. We also have the facility to offer an internet broadcast, ‘webcast’ of the service where the funeral may be viewed live (and also for 28 days afterwards) over the internet. Only those authorised by the person arranging the funeral can see this. There is a nominal hosting fee for this service and for an accompanying DVD should you require one. Please note that the DVD are simply a copy of the webcast. Both Chapels are accessible for people with mobility issues and there are separate disabled toilet facilities and parking . There is parking on site for 70 cars and an onsite waiting room with tea, coffee and toilet facilities. If you are using public transport there is a bus stop on Ferry Road, which is a 5 minute walk, via Warriston Road, to the crematorium, this is covered by the number 14 and 21 bus routes. The Book of Remembrance is intended as a permanent memorial to the deceased, accessible online at the link below.